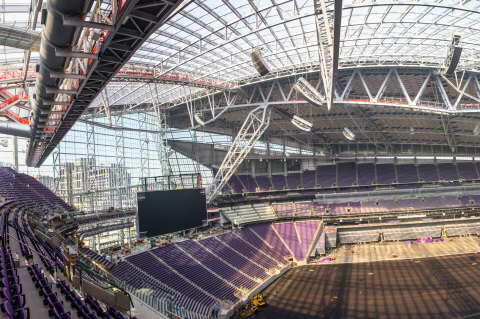 ST. PAUL, Minn.--(BUSINESS WIRE)--The new home of the Minnesota Vikings, U.S. Bank Stadium, will become the first sports facility in the United States with a transparent roof, permitting outdoor light without weather restrictions. Utilizing material from the franchise’s Official Science Partner, 3M, the venue will be covered by high-performance film, extruded from 3M Dyneon Fluoroplastic ETFE (ethylene-tetrafluoroethylene). The product, which lets light in, is lighter than glass, and more cost-effective than retractable alternatives. The stadium’s 248,000-square-foot roof and facade is covered by 75 three-layer ETFE film cushions, making U.S. Bank Stadium the largest ETFE film project in the United States. Some of the individually air-filled cushions are more than 1,200 square feet long and about 32 feet wide. The top film is printed with a geometric pattern, which scatters the sunlight and prevents a greenhouse effect in summer. In winter, the film roof protects the interior from the cold outside temperatures. To learn more about Fluoroplastic ETFE, you can read about it here. 3M and Dyneon are a trademark of 3M Company. New Vikings football stadium first in the U.S. to use ETFE film roof, utilizing 3M material, to create an enjoyable environment year round by permitting outdoor atmosphere without frigid temperatures.